Pooya left the ORL in June 2014. Click his LinkedIn tag. I obtained my M.Sc. degree from Tehran Polytechnic in 2008. In the same year I moved to the Netherlands where I took a position as a Ph.D. student under the supervision of Dr. René van Donkelaar in the Orthopedic Biomechanics Group, chaired by Prof. Keita Ito, at Eindhoven University of Technology. My Ph.D. research, granted by the Dutch Foundation Program STW, was entitled “Computer-Aided Cartilage Tissue-Engineering; a numerical evaluation of the influence of inhomogenities, collagen architecture and temporal culture effects”. During my Ph.D., I succsessfully proposed new strategies and ideas for the development of a more functional tissue-engineered cartilage. In 2013, I joined the Orthopaedic Research Laboratory Nijmegen as a Postdoc researcher. I’m currently working in the BMM project TRAMMPOLIN, the main goal of which is to develop synthetic knee joint meniscus implants which can be used in total meniscus replacement surgeries in clinical applications. Using a 3D finite element model (Fig.1.a) of a knee joint, we have focused on the optimization of the material properties of a medial meniscus implant. Mechanical properties are believed to be one of the most important design characteristics for the implant’s optimal functionality. 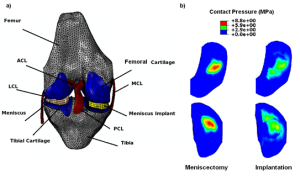 Results of the simulations so far have provided useful insights into the beneficial influences of a meniscus implant in preventing concentrated non-physiological mechanical stresses in the knee joint compared to those induced after the traditional meniscectomy approach (Fig1.b). Currently, we are conducting further evaluations to finalize the optimization of the material properties of the implants so that the mechanical condition of a knee joint’s post-implantation would be as close as possible to that in a joint with a native meniscus. b) the contact pressure on the femoral (top) and medial tibial (bottom) cartilage under a body weight load of 1560N, in case of meniscectomy (left) and with a meniscus implant (right).